As an airplane takes of from the nearby airport, the sounds of kids shouting fill my ears. I can only imagine what they must be thinking when they see a plane. Maybe of the exotic locations that fill their fantasies or maybe they just wonder where all these white people just came from. There is a whole world out there, and – at least for now – they won’t get to see it. 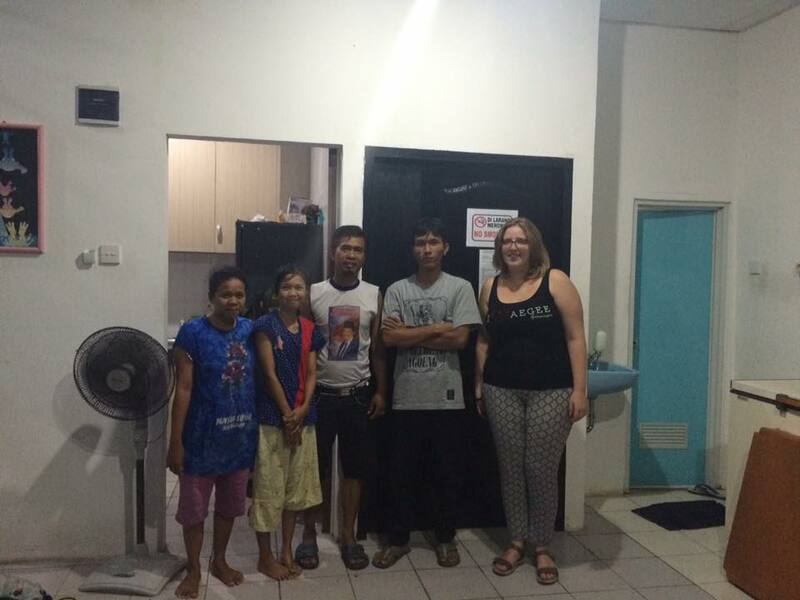 Yesterday I visited an orphanage in Jakarta, together with seven other Dutchies. So with all those strange people all up in their grill, it was no surprise that the children were a little shy in the beginning, staring and whispering, but not yet convinced they wanted to talk to us. I feared that maybe they just wouldn’t speak English, which is understandable. I couldn’t have been more wrong. Some of the children I spoke to had a bigger English vocabulary than most adults I met on the streets of Jakarta. After they got used to the company, one by one they started coming up to us. The six puppies that were running around were a great conversation starter – not that the kids needed this. They asked so many questions and really wanted to know all about you. Even if they didn’t speak English well, they would run to someone who would and came back blurting out the question as soon as possible, before they would forget it again. I’m not sure if they understood the answer, but they never failed to smile whenever they nodded and said ‘yes’ – no matter the question. During dinner we sang the cup song, and afterwards they played the Wilhelmus on a traditional instrument, which felt a bit surreal. The ambitions of these children are amazing. Their dreams are big and their dedication to these dreams is even bigger. Stewardess, architect, actor and even governor where some of the career choices that a couple of these kids where very deliberately working towards. Let’s take a sidebar here for a second. Because hearing these kids having their life figured out like a roadmap, made me realize that they know what they want better than I do. At this point in my life, the only thing I know for sure is that I would really love to finish a story and publish a book someday, but that is not exactly a solid plan. I have no clue what I want to do after all the adventures that I have planned so far, and even though I’m trying to figure it out… I haven’t yet. And it bothers me. Because without a goal, there is no way to get to that goal in an efficient manner. And I’m a secret – not so secret – fan of efficiency. After hearing all about their ambitions, hobbies and favorite animals, we ate the pancakes that we made for them. They loved it and decided to thank us with a song. They all wrote down our names to add us on Facebook and some wanted to take a picture with us, before it was time for us to go. Doing an internship in a skyscraper while sleeping in my fancy boarding house – where they do my laundry, I might add – is nice and all. But these are the activities that make you see the real people, the culture and the daily life of Indonesia. Even though these children have so much less, they have the capability to be so much happier. It all comes down to appreciating the small things. And even though I already was, a reminder like this never fails to make me grateful as well. Sign in the train. Don’t eat smelly durian! This qualifies as a slow day. In front of the most beautiful tree ever. My future husband. Just kidding. But I am in love with his streetfood. But first… Let THEM take a selfie. The best Martabak so far! As you may remember I had some plans for the time I would spend here. At first I was very optimistic, but when I arrived in Jakarta, things were a little different than I expected. Even though I googled intensely, I still found some things I didn’t prepare for (shocker…). The first thing I wanted to do was walk to work everyday. Well, when I worked in the hotel I did it two times, but it was more like a hike than a walk and it was much further than I predicted. Furthermore, the area that I lived in did not have a sidewalk. Soon I discovered the amazing go-jek, which is like a taxi service but for motorbikes and it was so cheap and fast that I caved and stopped walking to work. The second thing I wanted to do was eating a lot of fruit and rice with vegetables. Well… It was harder to find the food I wanted than I thought. So in the very first days that I stayed here, I ate way too little, because I didn’t know where to look for it (and secretly I was a little scared to go outside because everyone stares at me… all the time). But finally I found a good place to eat dinner, lunch was covered because I ate with my colleagues and I bought fruit at the supermarket (which was really cheap). The third thing was learning yoga and creating a morning routine. Up until now, my bed is so good to me, but then in the morning it will not let me go. We’ve got a bit of a love/hate relationship going on (but mostly love). As you may have guessed, the yoga thing is not yet happening. But now that I moved to a new house, things already feel so much different. Even though the current bed is even more comfortable than the last one, I am confident that I can start my morning routine here. I can walk to my new internship. I did it today, while listening to music, and it was great. There are sidewalks, there are less people staring at me and when I take the time to look up it is into a smiling face. Finally, there is just one road I need to cross like I don’t care about my own life. Also, even though I already figured out the food, still it becomes easier and easier to find places and things to eat. Every time I order something I will look at it skeptically, because I am sure that this will be the time it is something I will not like. Statistics tells me it must be coming up, because it is impossible to like everything the Indonesian kitchen has to offer. But three weeks in and I still haven’t eaten one single thing I didn’t like. Obviously, I’m waiting for the other shoe to drop. I am a little surprised by how much I like it here. I was so sure I was someone who would miss the luxury of my own house, I thought it would be so hard to make real new friends here and I thought I would have a lot of moments where I just wanted to stay in and not make an effort. But none of this happened. Sure, I would miss luxury, but there is luxury here. They clean my room every day and do my laundry and I pay less than half of what I did before. Making friends is easier than ever with couchsurfing, not to mention the great colleagues that come along. I have met so many amazing people already, and I want to hang out with them all the time (which makes that I don’t want to stay in, but I want to take a freaking go-jek and go out)! So far, so good. I can’t wait to see what the rest of my time here has to offer. Author Traveling SunnyPosted on September 22, 2015 September 22, 2015 Categories Jakarta, WordsTags couchsurfing, exercise, expat, Food, Indonesia, jakarta, living abroad, resolutions, Travel, yoga1 Comment on How about them resolutions? So… Things went a little differently than expected. Some things happened that a lot of people may see as a setback, but I just view it as more experiences and I always trust that everything will turn out the way it is supposed to. Bottom line, I left my current internship and will start another, and I moved to a completely different part of the city. I will keep this short and sweet, because it is late and tomorrow I have to be at the office at 8am. The new office, that is (and it is in a skyscraper, just thought I should add that). The hotel where I was supposed to do my internship was at a point where they did not organize a lot of events that needed marketing and there was not much to do there for me. They offered me other opportunities, but it went in a direction I didn’t want to take so I contacted the agency that helped me find an internship here and asked if they had any alternatives. They did, they even offered me three. I was really happy with the way they jumped in on such short notice (thank you Kim!) and two days after I decided I wanted to leave, I had an interview at another office. I was supposed to look at two other companies as well, but I had a really good feeling about the first so I decided to go for it. So today, on Sunday, I walked around the area near my work to find a new house. It is very easy here in Jakarta to get a room. You just look for the big buildings (the ones that are too big to house just one family) and you knock on the door, asking if they have a room. 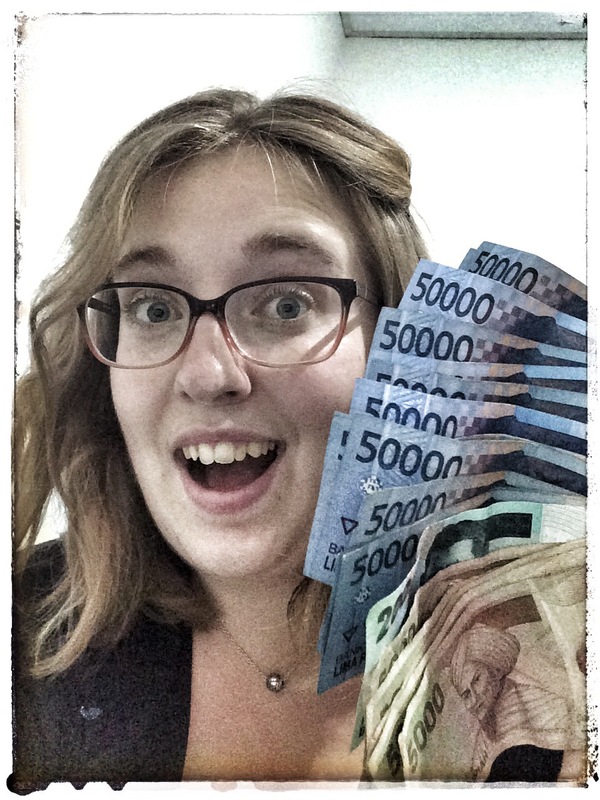 We passed some expensive ones (and by that, I mean 3 million rupiah… or should I say 200 euros. Super expensive, right?) and then we arrived in the area where the prices were more reasonable (again, everything is relative). After looking at some rooms, I ended up at a really nice residence. I will take some pictures or make a video later, to show you where I ended up. Added bonus: I now have a double bed. I was very sad to leave my previous residence though. The family running the place was really nice and I met a sweet young girl there that always helped me if I needed anything. Thank you so much Ulfa! I hope we meet again soon. I’m a sucker for documenting everything, so of course when I was about to leave, it was time to take a picture with all the people from the residence. They all helped me with my bags (of which there were way too many. How I gathered this much stuff in such a short period, I have no clue. But I will get rid of all of it before actually starting the traveling part of this experience) and waved goodbye as I drove away. So now I’m settled in the new place, and tomorrow I will start a new adventure, all over again. Me on a motor bike. So this post has the potential to be very deep and motivational. It can be about how traveling makes you richer because of the magical experiences and not poorer because you spend money. The value of traveling is in the people you meet, the places you see and the cultures you’ll experience. But in fact, this post will not be about this kind of value. I am referring to something far more practical. Every time I travel to a country that does not have euros, in the beginning of the trip I constantly calculate the rates. “How much is it in euros?” becomes a frequently asked question. Normally the amounts are still somewhere in the same area. Maybe you need to multiply or divide by two, or two and a half. But here in Indonesia, things are not so easy. One euro is approximately 16.000 rupiah. So everything I see, I have to divide by 16.000. This may seem a lot harder than it actually is. Usually I just divide by 15.000 and the thousands are kind of redundant. Everything behind the dot can just as easily be cents. But it does feel weird to take a million out of an ATM or to pay an amount of 15.000 to a taxi driver. But then when I calculate it back to euros… Well, all I can really do in those situations is smile. With the money I made at the ING in one hour, I can now eat dinner for two weeks. Sure, there are the occasional days where I want to eat something that costs more than a euro, but I could do it if I wanted to and that is just amazing. In Indonesia, you can also be a millionaire! All you need is 65 euros and you are classified as a millionaire. So if you ever need to feel rich, buy a plane ticket and get those extreme amounts out of the ATM. Then all that is left to do is to take a selfie.